Our clients include some of the most popular haunted attractions in the US. Clients of all sizes choose Haunted House Media for our ability to deliver effective, targeted, vertically integrated multimedia campaigns that deliver new customers to their haunt. The following is a snapshot of the market leaders that work with us to achieve their marketing goals. We just want to let you know that after getting on TexasHauntedHouses.com, Our business tripled!! We couldn’t be happier!! Our website is getting hit like crazy! The reviews are excellent! We think your site is THE BEST way to advertise a haunted house!! Thank you so so much! Cynthia Canada, Owner, Theater of Carnage, TX. Client since 2014. Cait and the entire team behind CTHauntedHouses.com (Haunted House Media) have proven to be the most reliable, professional, and actively engaged online presence professionals out there! Always easy to reach, willing to help, and redefining the bar in customer service. There is a reason why every year I continue to do business with them. CT Haunted Houses has always been and will continue to be a major part of my success story. Simply put, they are the BEST at what they do. Michigan Haunted Houses excels at providing an individualized experience for an advertiser. At Scarefest Scream Park, we have several special events that they were very willing to help us promote with written content and social posts that have been more successful than anyone had expected. Due to strategic online advertising with services like this, we were able to double our event attendance from the previous year. We were not sure what to expect when we started advertising with Michigan Haunted Houses, but after only one season with them, they have won customers for life. Advertising with NewJerseyHauntedHouses.com was definitely a no brainer for us. We got better results from NewJerseyHauntedHouses.com than any other haunt finder we advertised with. We will never give up our featured listing! Haunted House Media has been The Factory of Terrors outstanding internet media source specifically MAHauntedHouses.com, RIHauntedHouses.com and CTHauntedHouses.com. Cait is an outstanding Internet Advertising consultant and she produces impressive results through Haunted House Media for all her clients.I highly recommend Haunted House Media for anyone wanting to be on the cutting edge of Internet Marketing. Thank you so much for helping us put together an affordable advertising package for Panic Park Haunted House. We have been advertising with your site for years and we consistently see increased numbers to our haunted attraction. We were not able to open in 2016 due to flooding in late September. Due to lost revenue our advertising budget was reduced significantly. We know how important advertising will be for the upcoming season. It was an easy decision to spend a portion of our limited advertising dollars with Haunted House Media. People find us on this site. Panic Park will be back in 2017, bigger and better that ever. We at Creeperum.com want to express our gratitude for the professionalism and insightful assistance from the staff of your company. The people at CTHauntedHouses.com thoroughly explained how their services can benefit us. By listening carefully to our company’s needs, and customizing a payment plan to fit our budget, we were able to utilize CTHauntedHouses.com marketing services to maximize our advertising program. In short, thank you for making it easy to do business together. Angelus Perez, Owner, Creeperum, Hamden, CT. Client since 2016. Our Haunted Trail listed with MarylandHauntedHouses.com purchasing a premium add for the first time in 2017. We were ecstatic with the results of the advertising efforts. In that season our sales were increased dramatically by 6 fold! This was the very best advertising decision we made. The staff were great to work with and our account manager Gene was extremely helpful in explaining the options and helping us get set up. We will use the MarylandHauntedHouse.com advertising for 2018 and many years to come. I highly recommend Haunt owners use MarylandHauntedHouse.com for their haunt too! You really can’t afford not to! AZHauntedHouses.com has been a valuable resource for Sanctum of Horror. Every year we ask our customers how they heard about us, and a majority of the time they say AZHauntedHouses.com. Their team of content managers helped us every step of the way in developing our image on their browser. On several occasions we needed additional information or instructional how-to, and they were always willing to guide us through the process. Anyone wanting to put his or her haunt on the map would benefit from using AZHauntedHouses.com. Shawn Kaul, Owner, Sanctum of Horror, Mesa, AZ. Client Since 2013. I wanted to share my experience with Cait Russell and the SouthCarolinaHauntedHouses.com Team. We are a very small nonprofit haunt in a rural area of Lexington County in South Carolina. We have been doing the Gilbert House of Terror since 2001 and are all volunteers. We have always relied on our volunteers to help with the marketing since we do not have a budget for this sort of thing. So over the years our website has been passed down between different people within our haunted house family. The website has always been a stress issue with me. I have many other tasks within the haunt, so this was not one of my favorite things to even deal with. Cait had called and left a message offering their services. Not only are we listed on the SouthCarolinaHauntedHouses.com Page, but their parent company, Haunted House Media, has now taken over our website for us and completely revamped it to look professionally done like other haunts. We now also have our very own logo, which is super exciting for us. She has also been so great explaining things to me as I am not computer savvy at all. She has given me suggestions on what we can do to add more exciting things to our site and how that will help pull in more guests. Like I said from the beginning, we are a small haunt, and our guest numbers have been slowly declining over the past several years. I feel confident with this new site and advertising with the South Carolina Haunted Houses Family our numbers will increase and we will be able to continue to serve the Gilbert community. As a special added bonus I feel like I have a new friend! Thank you Cait and South Carolina Haunted Houses you have made my job and life much easier!!!! We decided to advertise our haunt on the MichiganHauntedHouses.com website last year and as we polled our customers we found that many of them had discovered us through this site which prompted them to come see us for the first time. The advertisements on this site are well done and the staff are very helpful. We found Haunted House Media [MissouriHauntedHouses.com] as we were setting up for our first year running a haunted attraction. We had been open a couple of weeks already, and were seeing a slow trickle of customers – and desperately needed more traffic to make things work. Since our site was new – we knew we needed to increase our online presence by listing in established, successful directories, and Haunted House Media’s sites [MissouriHauntedHouses.com, KCHauntedHouses.com, Haunts.com, etc] were consistently showing in the search results. After a quick call and discussion, we decided to pull the trigger and buy into what was offered. It was a risk for us – but one that more than paid for itself – and the reward was a steady line of customers until the season was over. As the customers began to come in – we needed to know what was working and what wasn’t with our ad dollars. When we asked customers how they found us and the consistent answer was that they saw us in the Haunted House Media directories for Missouri and Kansas City. When it came time to renew – we didn’t hesitate – and we can’t wait to see what the directories bring us this year! Jeremy Wood, Owner, The Living Dead Haunt, Lee’s Summit, MO. Client since 2016. We have been getting great feedback from your site. A lot of people coming to our location have been saying they found us through your site. So your site has definitely helped out…We definitely will be using your services next year. We are actually getting a better response from your site then newspapers and our personal website. I am writing in regards to my representative Cait Russell for OhioHauntedHouses.com and clevelandHauntedHouses.com. Cait has always done an outstanding job marketing your sites to us for both our haunts and for her excellent customer service. We really appreciate how she willingly offers suggestions and advice to make our businesses better. Just wanted to share our positive experience with your staff member. We at The Edson Incident would like to thank Cait Russell and the wonderful team of MichiganHauntedHouses.com/Haunted House Media for the great work and assistance they gave us. This was our first year advertising with MichiganHauntedHouses.com and they walked us through the perfect marketing plan for our business. They assisted, promoted and were always friendly and helpful with any questions or concerns. With the marketing plan put into place by MichiganHauntedHouses.com/Haunted House Media, our client base more than doubled. We had an amazing year and highly recommend their services. Already planning for 2018! Jodene Gifford, Co-Owner/Operator, The Edson Incident, Bay City, MI. Client Since 2017. IllinoisHauntedHouses.com – They are Amazing, they are extremely helpful and stay on top of things! Things can get busy with Haunters and things may slip through the cracks of getting things updated but they make sure they reach out to you to give you a reminder. They are also amazing at helping get the most out of your advertising packages which you may not get out of other business’. If I could, I would hire Cait as an employee here! Cait’s work ethic is amazing and is helpful is any way she can be for our business! Kaity Siegel, Owner & Operator, Statesville Haunted Prison & Siegel’s Cottonwood Farms, Lockport, IL. Clients Since 2013. When we started advertising SpookyFest with LIHauntedHouses.com we were more than pleased to find out not only were people clicking on our website, but they more importantly were attending our event. So often, at and before our event, people are telling us they have found us on LIHauntedHouses.com. Each year we have expanded our advertising and have seen a direct correlation to increased website traffic and event attendance. We find it is convenient to edit and update our own content on their website. In addition, lihauntedhouses.com has come and reviewed our event, provided signage for customers to rate our haunt and have provided outstanding service. Michele Anselmo, Director, CSTL's Spooky Fest, Rockville Centre, NY. Client since 2010. Dear Cait, I wanted to thank you, and NewJerseyHauntedHouses.com for the excellent work you have done for Scary Rotten Farms. The help you provide for me…for my lack of computer skills, is always appreciated. The amount of online traffic your site has directed to scaryrottenfarms.com is beyond what I ever thought possible! We Get Your Haunt NoticedWe provide the opportunity to promote your season attraction directly to a niche market of customers for little cost. 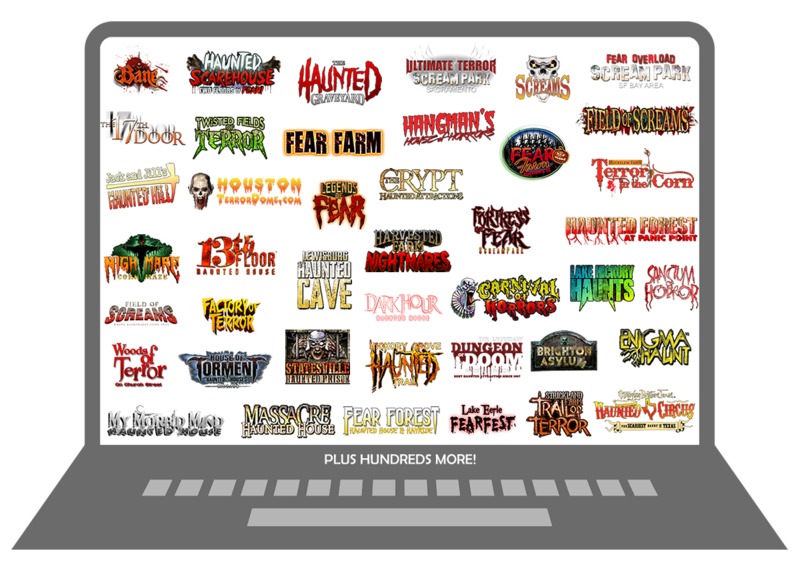 Why Choose Us?Over 90% of Haunt Owners who pay to advertise wind up renewing. Our website traffic has grown an incredible 520% since 2012.